Chelsea defender John Terry has been reinstated as England captain. The move by boss Fabio Capello had been widely expected, and comes ahead of the Euro 2012 qualifier against Wales. Terry lost the armband to Rio Ferdinand last year after reports he had an affair with the former partner of England team-mate Wayne Bridge. But Capello said on Saturday: "After one year of punishment, Terry will again be the permanent captain. I think one year's punishment is enough." Terry replaces Manchester United defender Ferdinand, who was reported to be upset at the prospect of losing the captaincy earlier this week. Ferdinand is currently injured, and Capello had planned to meet him to explain his thinking at Old Trafford on Wednesday. But the Italian told a media briefing at the Football Association's HQ at Wembley Stadium that Ferdinand "preferred not to meet me". Terry was initially appointed England skipper by Steve McClaren in August 2006, and Capello reinstated him in August 2008 after initially experimenting with different players in the role. Capello said he had been impressed by Terry's continuing leadership on and off the pitch in the past 12 months. "John, when he played without the armband, was every time a leader on the pitch, a leader in the dressing room. He was really good every time. "Always he is the same. He is a player that is himself a leader. This is really important. He is the biggest personality in the dressing room." Capello believes Terry will have learnt from his alleged off-the-field indiscretions and is confident he will have the support of the dressing room. He said: "Sometimes the leader can make mistakes - not only him but I, you, all the people. It is not a risk making Terry captain again. He understood the mistake and he learnt from his mistakes. "He will be a very important captain for us because when I choose him, I know he is a leader. I also think the players will be happy. I think so. They respect John Terry as a leader, absolutely." 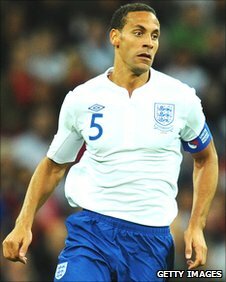 Ferdinand will revert to his previous role as vice-captain when he recovers from injury with Liverpool's Steven Gerrard, also ruled out of the Wales clash through injury, next in line to wear the armband. Capello continued: "I tried to meet Rio at the Manchester United game [against Marseille in the Champions League] on Wednesday. "He was ready to meet me but he preferred not to meet us. I don't know why. It is a question for him, not me. I was ready, I wanted to speak with him and explain my decision. "I hope I will meet him in the future to speak with him personally and privately, not by phone because I think by phone is not so good. "I hope he will be fit to play for the national team because he is one of the most important people with his experience and value as a player. "I spoke with Steven and it is no problem for him." Former England goalkeeper Peter Shilton told BBC Radio 5 live's Sportsweek programme that he would never have stripped Terry of the captaincy in the first place. "I don't think he should have lost the job," said Shilton, who remains England's most capped player with 125 appearances. "I'm not condoning what John Terry's done on certain occasions but he hasn't broken any laws and I think maybe the manager should have kept continuity in the first place. "You want the best on the pitch and John Terry has always been known as a natural leader, somebody who would run through a brick wall to stop a goal going in and the next minute he's up the other end trying to score the equaliser or the winner. "He's just a natural competitor and that's what you want from a captain. Certainly there are other things that go with the England job but I think he's the best choice. "I obviously felt sorry for Rio but I would put John ahead of Rio as a captain. You've got to make tough decisions and if Capello feels that he wants John Terry then that's what he should do." Wales manager Gary Speed, whose first competitive game in charge will be against England next weekend, added: "It's not my job to comment on [the decision], but John Terry would not change his game whether he had the armband or not. "He's a great competitor, he's a leader and he'll always be a leader whether he captain or not."